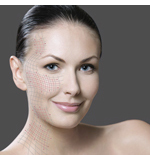 The Curative Facial is customized to specifically address Rosacea, Acne orPhotoaging. Each of these 3 anti-stress treatments include professional cleansing, gentle exfoliation, deep pore extraction, lavish facial, neck and shoulder massage, eye zone therapy and one of Pevonia’s multi-layered, bi-thermal treatment mask according to skin imbalance. 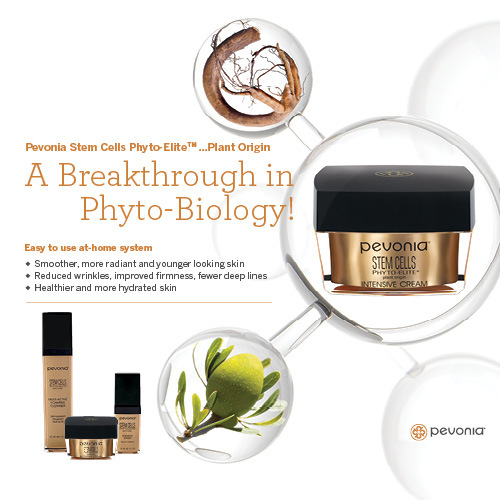 The ultimate anti-aging treatment including professional cleansing, gentle exfoliation, deep pore extraction, lavish facial, neck and shoulder massage and concluding with Pevonia’s multi-layered, bi-thermal Myoxy-Caviar Mask. Specifically formulated for prematurely aged skin incorporating a broad spectrum of antioxidants, botanicals and marine amino acids from caviar. The Stem Cells Facial uses freeze dried Comfrey Root and Argan Tree stem cells and Retinol to deeply hydrate and repair the dermis and epidermis. This treatment includes professional cleansing, gentle effective enzyme exfoliation, deep pore extraction, lavish facial, neck and shoulder massage, eye zone therapy and Pevonia’s multi-layered, Stem Cells Pyto-Elite mask. Recommended for reduction in wrinkles, improved elasticity, stimulates skin renewal and vitality. Firms and tightens loss of elasticity and refines skin texture instantly. Cutting edge encapsulated Biomimetic Liposomes and Microspheres deliver Sorghum, Diacetyl Boldine and Kombucha to repair and redefine facial color and texture. Includes exfoliation, deep pore extraction, eye zone therapy, lavish facial, neck and shoulder massage and multi layered masking. A unique facial specifically formulated for men over 40 incorporating a broad spectrum of antioxidants, botanicals, collagen, elastin and marine amino acids from caviar. 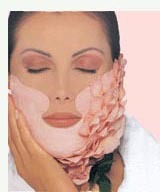 Also includes exfoliation, deep pore extraction and massage. An effective European facial including professional cleansing, gentle exfoliation with an effective enzyme peel incorporating aromatherapy and steam, deep pore extractions, lavish facial, neck and shoulder massage and concluding with one of Pevonia’s basic mask treatments. Add Pevonia Botanica’s new De-Aging Tropicale Body experience to your next Facial. Includes an exfoliating Saltmousse Body Glow for the décolleté, hydrating Body Mist of Hyaluronic Acid, Aloe and Pomegranate extract. Conclude the experience with a massage using the Body Balm rich in Collagen and Elastin Polypeptides, Pineapple and Papaya extract, Shea Butter and Tegospheres with Retinol and Hyaluronic Acid. Professional cleansing, enzyme exfoliation, deep pore extractions, back, neck and shoulder massage and mask treatment to help keep the skin clear, prevent future breakouts and uneven texture. 100% pure active ingredient ionized into the skin allows for best absorption and optimum results. Unencumbered by carriers or emulsifiers, Pevonia’s freeze dried treatments are truly skin care on the cutting edge. Add any one of the following to your treatment. Best results are achieved when done after a series of glycolic or microdermabrasion peels. Refines and smoothes uneven texture and enlarged pores with ground breaking probiotics, amino acids and Hyaluronic Acid. Restores dermal/epidermal junction bond. Recommended for acne scaring and after a microdermabrasion series. Smoothes fine lines and crepiness with Collagen, Caviar and Hyaluronic Acid. Improves suppleness and elasticity. Restores dermal/epidermal junction bond. Also recommended as pre- and post-operative treatment for plastic surgery. Hybiscus Esculantis plant naturally relaxes the muscle contractions which cause deep wrinkes. Recommended for dry, dehydrated skin with wrinkles. An antioxidant serum for dry skin with free radical damage. A powerful soother and healer for oily, acneic skin. A natural antibiotic for clogged skin with sensitivity. 20% vitamin C combined with Hyaluronic Acid provides repair for dry skin with UV damage. Provides instant relief from fine lines and repairs crepiness. Done regularly, strengthens thin tissue around the eye contour. Provides anti-stress relief for tired, puffy eyes. Stimulates circulation. Do in conjunction with Cryo Collagen for an amazing anti-wrinkle-anti-puffiness result.NOTE: We encourage all Facial and Massage Series to be used within a 6 month period of time for best results and to avoid annual cost increases. Celebrating our 16th Anniversary – John Francis Spa Founded January 2003! Power Repair Micro-Pores | Did you know?